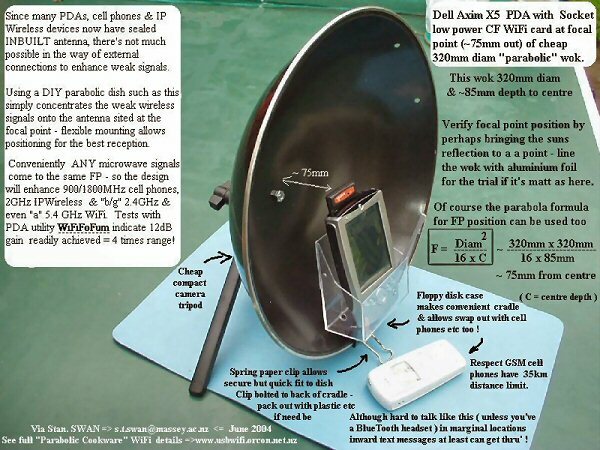 The folks at the usb-wifi section of Orcon.net have assembled a super, step-by-step how-to guide, complete with photos, for making your very own wifi wok! The largest (300-mm diameter) provides a 15- to 18-dB gain, enough to extend the range to between three and five kilometers, costs about US$5.00 and comes with a user-friendly bamboo handle that suits WLAN fieldwork — if you can handle the curious stares! Complete with Chinese parabolic cookware and notepad by Stan, you gotta check this out. The phrase “poor man” is not usually considered insulting, but indicates (possibly with a degree of DIY pride) a desire to make do, use it up or wear it out — while laterally solving a problem. The lab notes below intend to document rather than entertain — suggest you stay with images for the latter! 25th April 2004: Well, ANZAC day dawned fine here in Wellington (NZ), so in best military tradition we ran a few LOS (Line of Sight) scouting trials, supporting the USB device on a broom handle tied to the roof and fed by 5 metres of regular, el cheapo, USB cable from an XP laptop running the new NS 0.4 inside.